I reported a price reduction to the 38m motor yacht Indigo Star on 20 October 2010, and today brings news of another cut from Jurgen Koch at Fraser Yachts. Indigo Star was built by Siar Moschini in 1995 to a design by Andrea Bacigalupo and this ABS classed superyacht was last refitted in 2008. Toys include a Sea-Doo 3D, a Sea-Doo RXP 215hp, Slalom water skis, kneeboard, doughnuts and banana, snorkel equipment and four full sets of diving equipment with dive compressor. 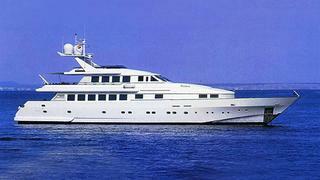 The new asking price of Indigo Star is €3.95 million, down from €4.9 million.